Frigidaire Affinity Washer shows e41 Error Code – My washer is showing the E41 error code. I unplugged the washer to try and reset the washer but it did not help the issue. I still get the E41 error code. The Frigidaire washer was washing and just came to a stop during the mid cycle and won’t drain or spin. What part of my Frigidaire Affinity Washer do I replace to clear or reset the e41 error code? Frigidaire Affinity Washer Error Code E41 – How To Fix? If not replace or check the main control board. 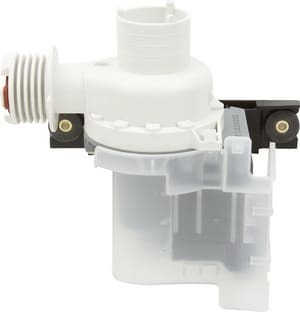 Or clean out or replace the drain pump if your Frigidaire Affinity Washer is full of water and has the E41 error code showing. See below for further troubleshooting. 1 – Is the washing machine door closed? 2 – No? Close the door. – Check all wiring to make sure all is secure and no damage is found on any wires or wire harnesses. – Disconnect the plug from J2 on the control board and check for continuity between the pins in the plug. – If you have continuity then check the door strike. If it is ok replace the door switch assembly. – If no continuity then replace the control board. 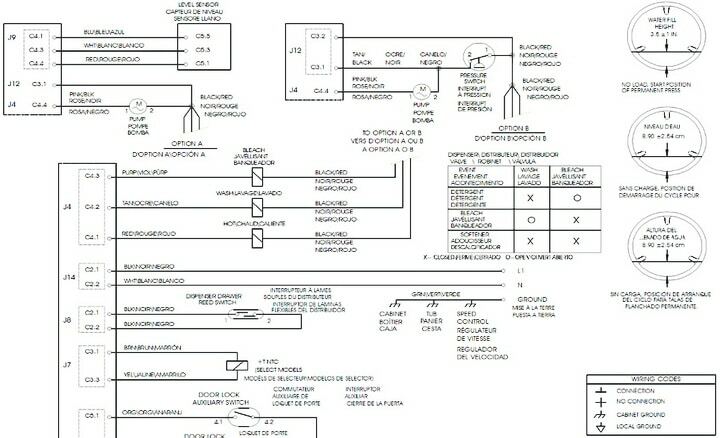 -There may be a foreign object jammed in the drain motor that can show the error code e41. -Check for any blockage in the drain pump motor. -The drain pump and or hoses can get blocked with foreign objects and not drain. -Remove the hoses from the drain pump and check to see if any foreign objects are blocking it. -If washer is full of water, then water will come out of hoses when you are checking for blockages. -Use a bucket or towels to soak up the water. -On non-digital display models, turn the Program Knob to start position, Drain/Spin. -On digital display models, turn the Program Knob to start position, Touch Up. -Press Pause Cancel to turn off the LEDs. -Within 5 seconds, press and hold the Option and Pause Cancel buttons until LEDs start sequentially chasing, then release buttons. 1) All the LEDs will sequentially light. Pressing a button below a light cluster will light all the LEDs in that cluster at one time to confirm functionality. 2) Turn the program knob 1 click clockwise from the start position. 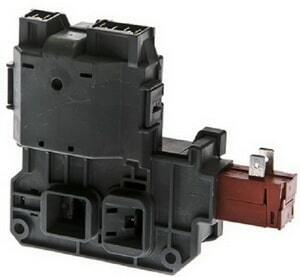 The hot water solenoid will activate and hot water should enter through the detergent compartment. 3) Turn the program knob 2 clicks from the start position – The bleach water solenoid will activate and cold water should enter through the bleach compartment. 4) Turn the program knob 3 clicks from the start position – The bleach and the wash water solenoids will activate and cold water should enter through the softener compartment. 5) Turn the program knob 4 clicks from the start position – The door lock solenoid will activate. 6) Turn the program knob 5 clicks from the start position – The door lock solenoid will deactivate and the loading door can be opened. 7) Turn the program knob 6 clicks from the start position – The washer will fill and tumble. 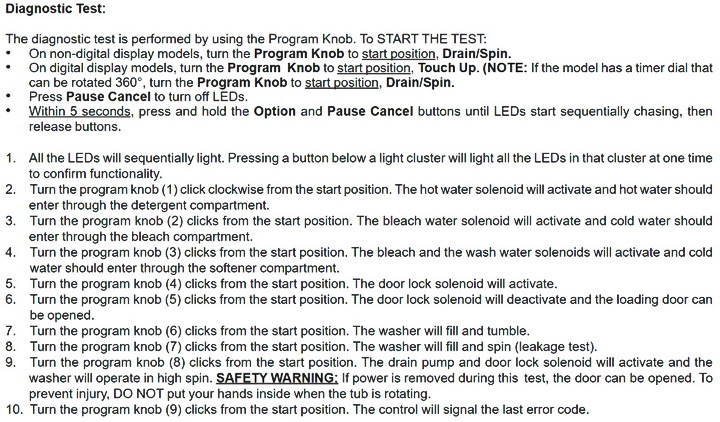 8) Turn the program knob 7 clicks from the start position – The washer will fill and spin (leakage test). 9) Turn the program knob 8 clicks from the start position – The drain pump and door lock solenoid will activate and the washer will operate in high spin. 10) Turn the program knob 9 clicks from the start position – The control will signal the last error code. WARNING: If power is removed during this test, the door can be opened. To prevent injury, DO NOT put your hands inside when the tub is rotating. Need assistance with your Frigidaire Affinity Washer? Please leave a question below and we will assist. This is the exact opposite of what the service manual says. Previous post: How To Remove A Headphone Jack That Broke Off In Phone? Next post: Samsung Refrigerator RB Model Error Codes – How To Fix And Clear?